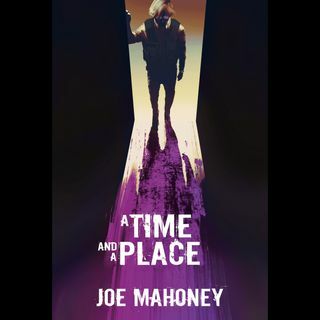 Joe Mahoney Visits The Coffee Shop to Discuss "A Time and A Place"
Calling upon Doctor Humphrey for assistance has not been particularly helpful, because the good doctor’s diagnosis of demonic possession is clearly preposterous. Even the demon currently ensconced on the front room couch agrees it’s preposterous. But then, how else to explain the portal to another world through which his nephew and Humphrey have just now disappeared? Barnabus knows their only chance of rescue is for Barnabus J. Wildebear himself to step up ... See More and go through that portal. Thus begins an existential romp across space and time, trampling on Barnabus’ assumptions about causality, freewill, identity, good and evil. Can Barnabus save his nephew—and incidentally, all of humanity? Joe Mahoney works full-time for the Canadian Broadcasting Corporation, where he’s helped make many radio shows over the years, including Writers and Company, Quirks and Quarks, and Q. He’s produced documentaries on science fiction for The Arts Tonight and The Current. He produced Six Impossible Things, a compilation of short fantastical fiction, curated by Nalo Hopkinson, for Between the Covers, and wrote and produced Faster Than Light, hosted by Robert J. Sawyer, for Sunday Showcase. He spent a decade making radio plays, working on productions such as The Merchant of Venice, The Handmaid’s Tale, and Afghanada, with some of the finest actors, directors and writers in Canada. He Five Rivers Publishing ISBN 9781988274256 Trade Paperback, 6 x 9 412 pages $34.99 eISBN 9781988274263 $5.99 engineered and story-edited Steve the First, a post-apocalyptic science fiction radio play mini-series, and its sequel, Steve the Second, which won a silver Mark Time Award. He produced and directed the pilot of Canadia: 2056, and story-edited all subsequent episodes. He is responsible for all the funniest bits. In 2007, Joe left production to join the CBC management team. These days he’s Director of Production Support. Joe’s short fiction has been published in Canada, Australia and Greece. He’s been nominated twice for an Aurora Award, one of Canada’s top awards for science fiction and fantasy, for his work on CBC Radio. Joe lives in Whitby with his wife and two daughters, and their golden retriever and Siberian forest cat.